The VCP1600 pressure sensor plate is an accurate and cost-effective way to identify the plantar pressure profile. 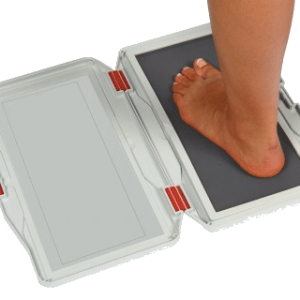 The plate has 1600 sensor which can be used for 3 types of scanning: Static, Dynamic and Postural scan. Provides an easy and efficient patient follow-up (up to 4 exams comparison), real time display, immediate storage or load of recorded exams. Auto calibration system requires no recalibration over the lifespan of the platform. Visualisation of the centre, maximum and average pressure calculations, as well as weight distribution pattern. Easy to use for everyday communication with patients and practitioners by the various measuring possibilities and a 1:1 printed report option.